Right now I’m well on the way through Wanderer book four and book five (which should be the last in the series) will be written next. The question is… what do I write after that? I’ve got loads of new ideas floating around in my head and starting a new book / a new series has a lot of appeal but first there’s some unfinished business – the Dark buy doxycycline tablets 100mg Soul Chronicles. I already have a good idea of how Daniel’s story will progress and I’d love to explore it further. But. You knew there was a but coming didn’t you? The two Dark Soul books are doing well but they haven’t taken off as well as the Wanderer series and that is reflected in the total number of reviews. That means some of the biggest promotion sites (in particular Bookbub) won’t take them yet, which gives a catch 22 situation of not getting the reviews because I can’t promote them widely enough, and not promoting them widely because I can’t get enough reviews. If that doesn’t change then it might make more sense to write another book or two in a completely new world / universe before returning to the Dark Soul series. 1) Write a review for Dark Soul Silenced – Part One and post it to Amazon.com (you can post there even if you bought it from another Amazon site). Almost all the promotion sites only look at the US Amazon review count. Please post it to your own Amazon site as well. 3) If you wrote a review for Dark Soul Silenced – Part Two but not for Part One then please review that too. Most people will come to the series via book one, and that’s the one I’ll be trying to get featured for advertising. 4) Talk to any friends and family who might be interested in that type of book. 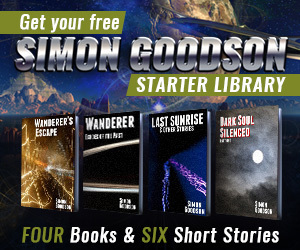 Tell them they can get the Dark Soul Silenced – Part One eBook absolutely free . Tweet, post or even talk (gasp!) about it. 5) Reviews on Goodreads help too – you can post the same one you write for Amazon. But if you only have time to write a review in one place Amazon.com is the key location. Dark Soul Silenced – Part One has 17 reviews so far. There’s no hard and fast rule but I think getting that up to 30 or 40 will make a huge difference, and getting it to 50 or 60 will give it a really good chance of being featured by the heavyweight promoters. That may sound a lot but it starts with just one review from one reviewer. Lets all get those reviews written. It is great to comment here and I know Simon appreciates our support & encouragement. Where we can really make a difference is in posting our reviews on Amazon & any social media sites we are on. After you write your review, go back in a few days & make sure it is there. I just resubmitted my review as my first one got lost in the ether.